During the winter of 1936-1937, alarming news stories began to come out of Alaska. At that time, most Americans knew very little about this territory. Most of us had heard of “Seward’s Folly,” named for the secretary of state who had arranged its purchase from Russia in 1867 for the sum of $7.2 million, or about 2 cents per acre. It would be in the news again in 1959, when it became the 49th state of the United States. In between, most of us visualized the territory, incorrectly, as a vast area of little but ice and snow. 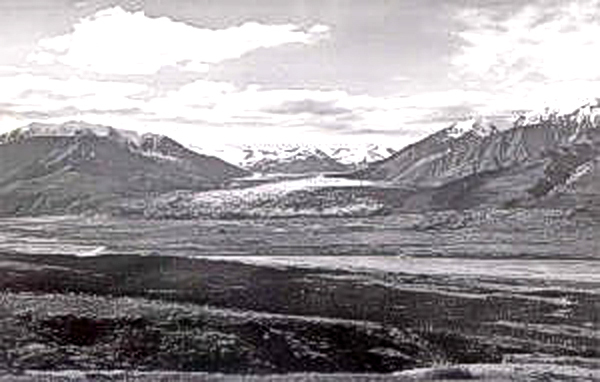 The glacier advanced about one mile each month between December 3, 1936, and March 7, 1937. It is classified by scientists as a “surging” glacier. Some glaciers surge from time to time, others do not. The difference is not fully understood, but appears to be related to a failure of the water drainage system within and beneath the ice. The photo below shows the glacier on September 9, 1937, shortly after its surge (U.S. Geological Survey, photograph by Fred Howard Moffit). The surge ended just short of the Delta River, but was watched closely because of the potential hazard to the Richardson Highway. Geologic evidence indicates that another surge had taken place 600 years previously, and that one had dammed the river to form a lake. Now, in the event of another surge, the stakes are still higher. The trans-Alaska oil pipeline was built through the same narrow corridor just beyond the river. 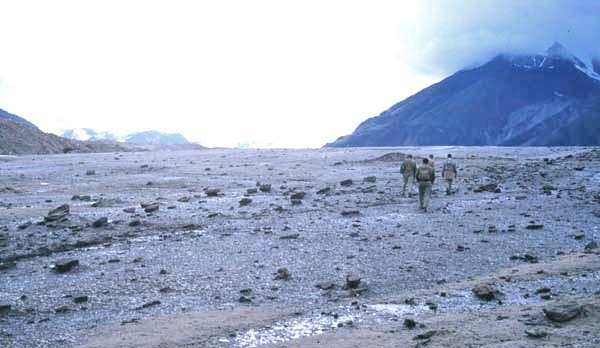 A later photo, made in August 1994, shows clearly the “Bath tub ring” effect – the moraine (rock debris transported and deposited by the glacier) plastered up against the valley wall, reflecting the former high levels of the glacier during the surge (U.S.G.S. photograph by Rod March). The foot of the glacier is now about 3 miles short of its maximum surge point. 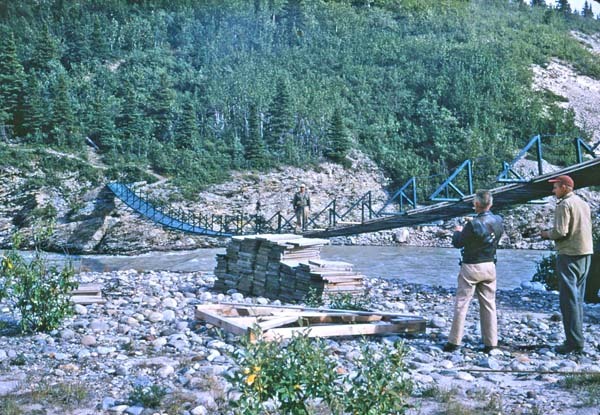 In the summer of 1952, the Alaska Terrain and Permafrost Section of the U.S. Geological Survey sent out four field parties, totaling about 15 men, to study the glacial history, engineering geology, and permafrost conditions of several areas in central Alaska. I was a member of the party working along a 65-mile stretch of the Glenn Highway, from the village of Slana to Tok Junction, where the Glenn and Alaska highways meet. By mid-August, we had all been working hard seven-day weeks for two and a half months, and it was time for a bit of relaxation. The four parties met, and together we toured all four field areas, each party hosting a field trip to show the most interesting geologic features it had found. 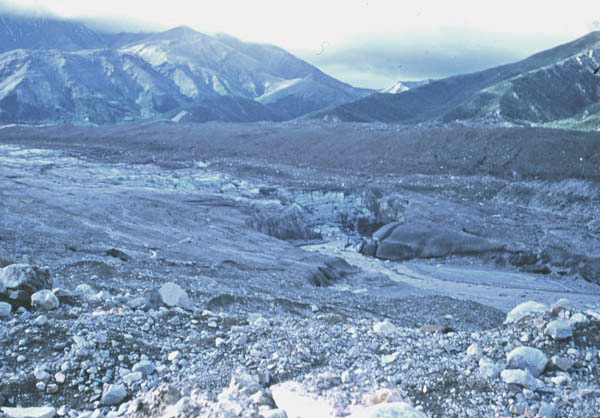 And, for the party working along the Delta River, the Black Rapids glacier was the prime attraction. 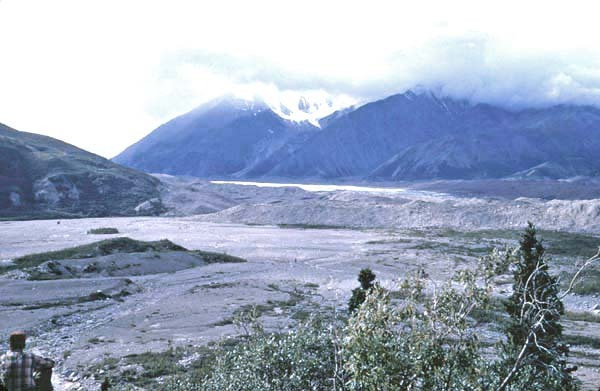 We approached along the Richardson Highway, and then pulled off for a view of the glacier, about 3 miles away, and the heaps of moraine it had left as its forward edge broke up and began to melt away. Note: You may click on any photo to enlarge it. We crossed the Delta River on a cable bridge that seemed lightly built and somewhat unstable, so that we allowed only one man at a time to make the crossing. As we approached the hills of moraine, we soon noted that they were actually detached blocks of ice, covered by only a thin veneer of rocky debris. After walking about 3 miles, we passed by the ice cliff marking the current foot of the glacier. The surface of the glacier was touted as a veritable highway through the rugged, forested and snow-covered mountains. Its smooth surface offered what we understood to be a safe and easy walkway. Despite all that, I became slightly uneasy upon learning that nobody in the group had a rope, or a set of crampons (steel frames with downward-pointing spikes, attached to the boots to prevent sliding on ice). As our march progressed, I saw features that might justify a bit of uneasiness. 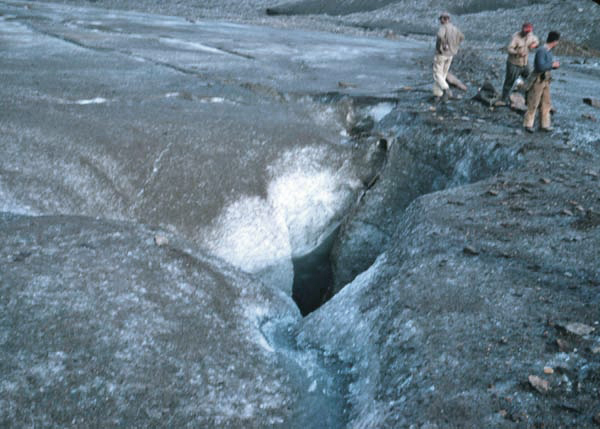 First, the crevasses that appeared where the glacier’s downward descent became steeper than usual. A slip of the foot in this area could be decidedly inconvenient. 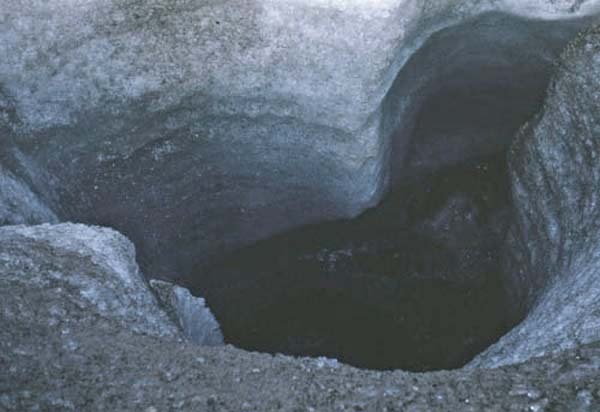 Next, a spectacular feature that we called a Moulin (French for “mill”), a large and deep hole through which surface melt water drained down into the innards of the glacier, ultimately to its bottom which might be anywhere from a few hundred to a couple of thousand feet deep. As I felt compelled to include a down-hole shot with the camera, my stomach became queasy with the concern that crampons would nicely have prevented slipping and sliding. Of course, crevasses and moulins would be most dangerous when hidden beneath a bridging layer of recent snow. But I still wondered whether similar features lurked beneath thin ice left over from last winter’s snow. 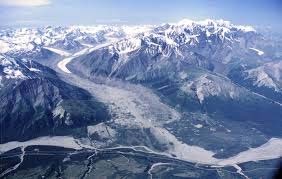 If I had doubts about the safety of glacier-walking based on my own experience there, some years later all my dreams – or, rather, nightmares — were realized when I saw a picture of the same glacier shortly after the Denali Fault Earthquake, a magnitude 7.9 quake that occurred on November 3, 2002. This tremor caused several massive avalanches of rock debris directly onto the surface of the glacier. 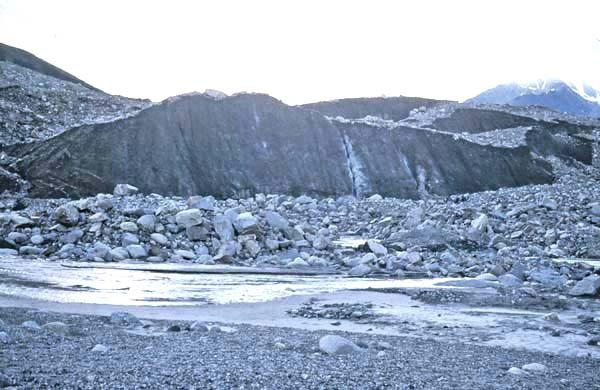 The debris spanned the one-mile width of the glacier, and covered about 13 square kilometers of its area. The odds might be against such an event, but this was definitely not a place to be walking at that time. 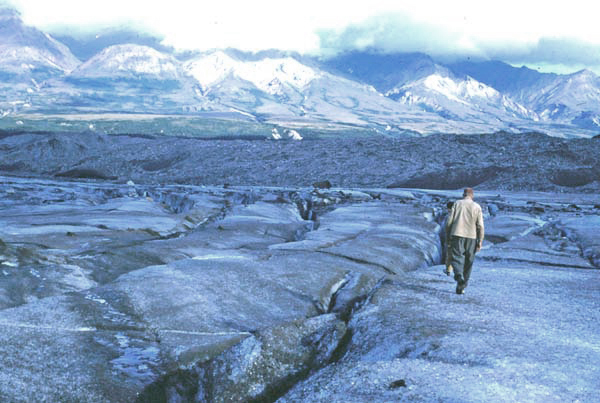 This entry was posted in Travel Adventures and tagged Alaska, Black Rapids, Earthquake 2002, Glacier, Surging Glacier. Bookmark the permalink. Great narrative but boy, each picture was worth a thousand words – glad you had those. Imagination wouldn’t have done anything any justice! Keep them coming! Amazing first-hand account with breathtaking photos. Thanks for sharing the story!